good morning! hallelujah! it's actually sort of warm here! the snow is melting and will continue to do so for a few days. the cold will return, but this is a blessed break from it all. after I do total gym this morning I hope to take ralphie to the park--he has major cabin fever. but with his little feet and the sub-zero cold, walks outdoors were out of the question for awhile. dorijane is in the crate--she seems to have hurt something--I can't really even tell what. 5 days on anti inflammatory have her moving and feeling better, but I am keeping her activity restricted at least awhile longer. she goes in to see dr. payton soon, so I can find out then exactly the nature of her ouchie. she is acting fine--not really even painful--just an intermittent unsteadiness that I can't even localize by watching her. the warm weather meant I was able to go down and start painting the barn. I got all the cutting in finished--now I have to roller the large sections--that shouldn't take long at all. can't wait to see it done--then it's time to shop for linoleum scraps. I still have some work to do on the windows--two of them need another coat of paint and the one needs some rotted wood cut out and filled and then I will paint it. but each little project gets me closer. 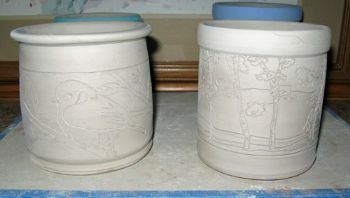 today I am going to try making some of what potter simon leach calls "biscuit jars". I wedged some 3# chunks of clay yesterday--first slam wedging them (exactly what it sounds like) to blend a couple different textures of the same clay (some very wet, some too dry and some just right) and then bull nose wedging them. bull nose wedging uses two hands and is a type of kneading motion. it homogenizes the clay and gets it ready to throw. the problem with it is, it makes my wrists HURT when I have to work with clay balls this big (my hands are quite small). there is another method of wedging that is supposed to be easier on the hands esp. for large amounts of clay, but I can't seem to wrap my head around it. that's one of my goals this year--to master spiral wedging. 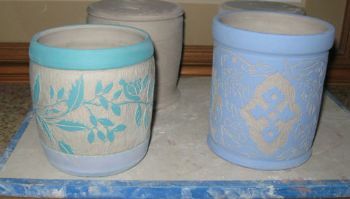 anyway--my intent is to make these biscuit jars and then carve them with teasel blooms. I really like carving clay--and have actually been working on some of them the last week. here are the ones I have finished--the first were painted with underglaze and then carved away--the fired clay will be white where it has been carved. I have to do some touch up on the underglazes after the carving. the other two were carved on raw clay. I will inlay black in the carved lines and then color in the objects--kind of like a coloring book. happy with how all these have turned out so far. time to get in gear. have a great day! Those jars are beautiful!! How are you doing? Wow!! I love those biscuit jars. Enjoy the warmer weather. We did while it was here. Today we are transitioning back to winter. Enjoy the better weather while you have it, hoping Dorijane feels better. Oh, my goodness!! These are beautiful!! You are becoming very talented!! ohh these are beautiful! I really like the design on the aqua colored one. I'm always a sucker for floral motifs. I really like the shape of the jars too, especially the one on the lower left the one with the pulled out rim. So cool .